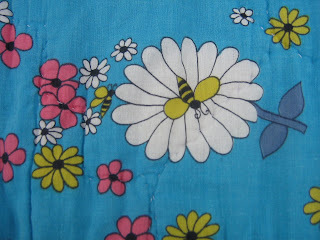 More friends and a blog: Garage sale bargains. Last weekend we went to a garage sale in the neighbourhood. There were soooo many goodies that it would have been easy to get carried away. I satisfied myself with buying a quilt (yeah, I finally found one, and for 50c), a chair that brings special memories for me ($1), a few books for the boys and some free 2 quart Gem jars. Free! How could I resist? Actually I only took one box, thinking that I should leave some for others, the next day the lady phoned me and asked if I wanted all the rest before they took them to the dump. Well, I had to save them from the dump, didn't I? So S went and picked them up and we gave a dozen to our neighbour for her bulk goods and will use the rest for our own bulk stuff and holding nuts and bolts and such. Here is a picture of the chair. 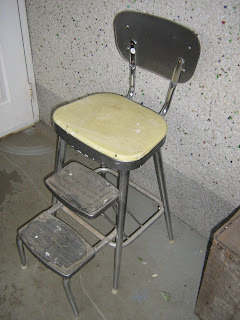 My grandma had one of these (but brown upholstery) that I used to use to stand on to cook at her house and sometimes to sit at the "adult" table for meals. I loved it because I could rest my feet on the steps. It is just right for little ones and I think E will enjoy using it for cooking too. The lady I bought it from (who I found out used to play in the playhouse in our yard when she was little) told me she used to get her hair cut while sitting on it. That seems like a pretty good idea to me as it will get the boys up to a better height for me to cut their hair. 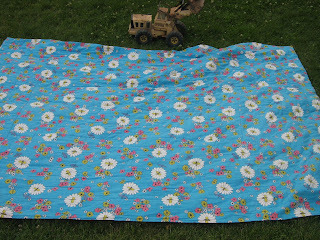 This is the quilt, not too fancy but what I really like about it is the fabric used on the back. It will go on its first camping trip with us this weekend, we are heading to the mountains. 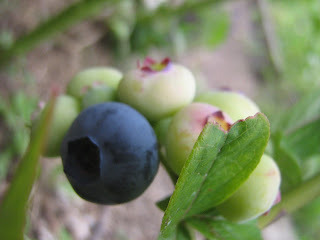 And a picture of the blueberries which will start disappearing quickly now. They are barely ripe but E can't resist. Did I read that right?!? 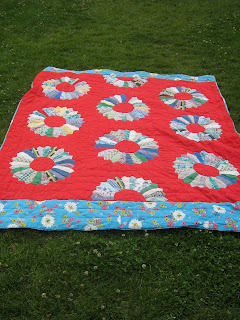 50 cents for the quilt? Score! Ha! My vivacious great-aunt Lila had one of those exact chairs which she used in her kitchen. I remember it best as the "telephone chair". My aunt used to perch there to chat while on the phone. That brought back some memories.